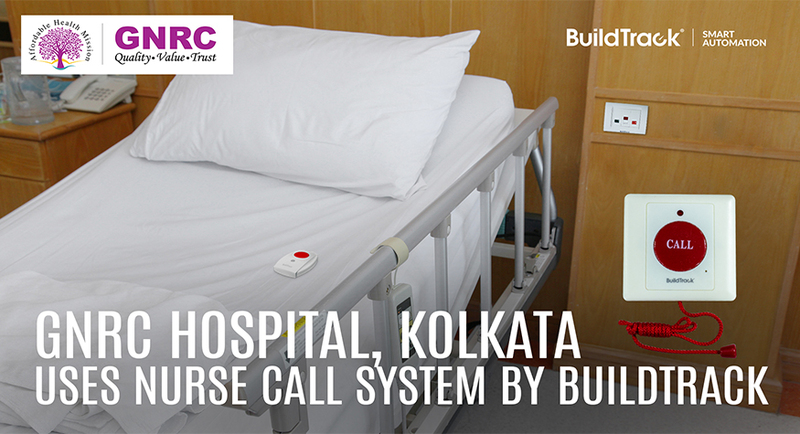 BuildTrack has installed its Nurse Call System at the GNRC hospital, Kolkata to provide patients an option to indicate about their emergency lying on bed and thereby improving the operational effectiveness for the hospital staff. Each patient bed is given a wired panic button which when pressed will give an indication to the nurse station. Pull chord sensors are provided in the patient washrooms which can be used in case of emergency. Both panic button and pull chord sensor also triggers an indication light placed outside each room to enhance visibility for the doctor or nurse. The nurse station will have a display which will indicate whenever the panic button or pull chord sensor is pressed. It shows the room number from where the button is pressed. When the nurse responds she resets the LED from the bedside switch module. On the BuildTrack application, the manager can monitor the emergency acknowledged activities from the Nurse Team. It can also generate report to track the Turnaround Time of the Nurse team for handling emergencies. About GNRC (http://gnrchospitals.com): GNRC (formerly known as Guwahati Neurological Research Centre), the first super specialty healthcare centre in North East India, was established in 1987. The Kolkata hospital is also a super specialty one with 350 beds. About BuildTrack (www.BuildTrack.in): BuildTrack is a leading brand of Smart Automation & Internet of Things products and solutions from Surmount Energy Pvt Ltd. BuildTrack’s Hospital Solutions are designed to enhance the patients stay experience and improve the operational effectiveness for the hospital staff while significantly lowering the energy consumption of the hospital.